Paying an out and out penalty for saving your money. 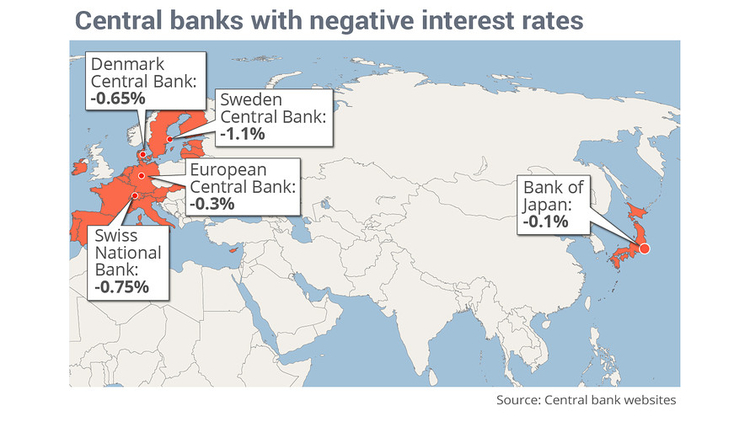 In Europe, negative interest rates have been used to attempt to kickstart inflation and to get banks to lend out money; if they have to actively pay to sit on it, suddenly making loans looks a lot more attractive than having that money be slowly chipped away by punitive negative rates. If the Fed decides they can’t go on yet another money printing binge – or if they decide such a tactic isn’t generating the stimulus benefits they want – negative rates may be their next logical step in the ever more constricting and ridiculous game that is trying to dictate the direction of the entire economy, all the time. With the phenomena of negative interest rates taking hold this past decade, which is pure monetary insanity it’s quite clear that the United States is going down that path. As zerohedge pointed out, Fed president (San Francisco) John Williams said that to fight the next recession, global central banks will have to come up with a whole new toolkit of solutions. Alongside negative interest rates, will the Federal Reserve take a page from the Swiss National Bank’s playbook by purchasing equities? Well if they need to retool the toolkit that certainly looks to be another viable option as quantitative easing has turned out to be a bandage maneuver. It’s evident that central banks know that they will have no choice with regards to pursuing negative interest rates in the next recession which could explain why we see so much propaganda within the mainstream media of why eliminating cash will serve as such a positive for society when it comes to fighting the underground world. In reality, the war on cash has a much more significant agenda, as it forces all citizens to the banking sector to trade cash in for bank deposits. Yes, after the financial meltdown of 2008 this continuous war on cash will make the big banks even bigger and centralize money even further. This serves as a huge bonus for central bankers as it eliminates bank runs and allows the seamless transition to implementing NIRP.